Produced by TenRen in 2004 to help commemorate the "Year of the Rooster" on the Chinese Zodiac, this "Silver Rooster" tea pot is available exclusively from TenRen in limited quantities. People born in the Year of the Rooster have the following birth years: 1909, 1921, 1933, 1945, 1957, 1969, 1981, 1993, and 2005. Each teapot was produced with a great deal of attention to the fit and finish. The teapot has an inner convex sieve which helps to prevent tea leaves from blocking the flow of the tea through the spout. 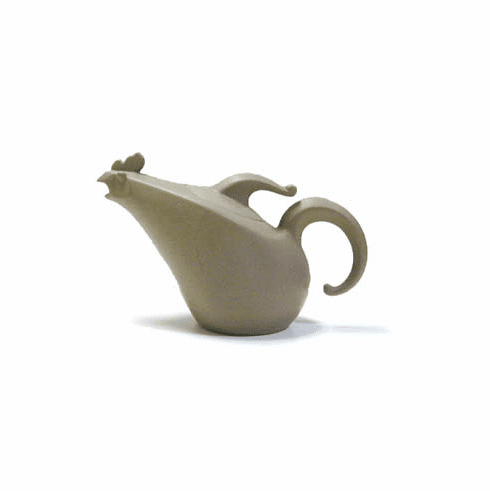 Made from grey clay and fired at a higher temperature for high quality, the teapot is ideal for serving semi-fermented teas such as Oolong, King's, Pouchong, and Ti Kuan Yin. This teapot has the rooster's comb as the lid and comes with a special red satin lined box for a beautiful presentation. Yixing tea pots such as this one are prized by tea connoisseurs because of the clay's special characteristics. With repeated usage, this pot will acquire its own unique flavor and increased luster and coloring that contributes to the enjoyment of tea. After usage, rinse with hot water and avoid using soap and other scented products that may be absorbed by the clay. This teapot holds about 7.5 fluid ounces (200 ml). It is about 5.25 inches (16.5 cm) in length, 2.5 inches (6 cm)in width, and 4 inches (11 cm) in height. Shipping weight is 1.00 lbs. Temporarily out of stock.